OK, maybe don’t run out to the backyard and fell that beautiful oak tree that provides cool, shady relief during warm summer barbecues, but there is some truth to the idea that utilizing our hardwood resource like can be of benefit to the pale blue dot we call home. While there are justifiable concerns regarding the removal of trees across the planet, the American hardwood industry is a story of success with very real benefits to the environment. Not all forestry practices are the same, and these varied approaches to harvesting wood can mean the difference between helping and harming the environment. When many people think of tree harvesting, images of forest destruction and clear cutting come to mind. For example, in some areas of the world, beautiful trees are burned to make way for cattle grazing, palm oil production or bamboo growth. The harvest of American hardwood is a very different endeavor with very different results. In the continental United States, there is an abundance of hardwood forestland, covering 279 million acres. Approximately 80 percent of this hardwood forest land is controlled by millions of private landowners. From this private land, about 92 percent of all hardwood production is generated. It’s typical for these private landowners to harvest only once or twice in their lifetimes. In stark contrast to clearcutting, the harvesting of hardwoods is a selective process that means removing trees at the height of their maturity, after they have absorbed as much carbon as they will absorb in their lifetime. 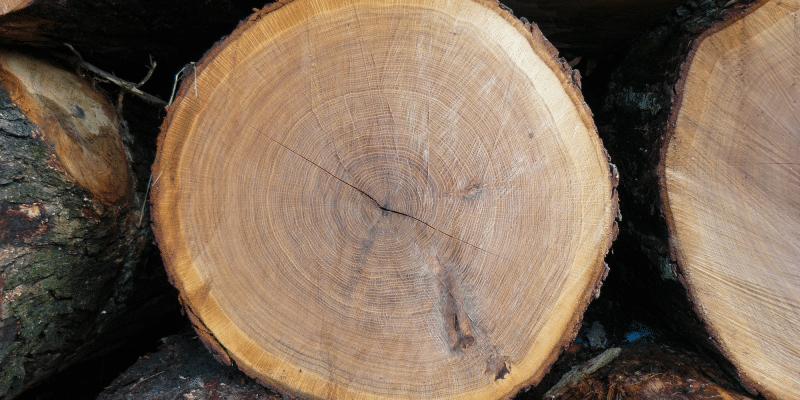 Once a hardwood tree is harvested and rendered into logs, boards and ultimately furniture, flooring or millwork, half the weight of the dried hardwood is carbon, captured forever. Unlike softwoods, hardwoods will generally propagate without the deliberate planting by a farmer. In selecting mature trees for harvest, the forest canopy is opened, allowing light and water to reach seeds the trees have dropped to the forest floor. Hardwood trees are known to be “shade tolerant”, which means that they don’t require a great deal of sunlight to grow. In contrast, softwoods are “shade intolerant,” requiring the clear cutting of swaths of forest and replanting by hand to allow maximum light to reach the saplings. The American hardwood industry is truly sustainable and renewable, driving forest growth. Through the diligent practice of sustainable forest management, in the last 50 years hardwood forest acreage in the United States has actually increased by 18 percent. From the American Hardwood Information Center: “According to the U.S. Forest Service, there were 119 percent more hardwood trees in 2007 than in 1953, with the growth-to-removal ratio of 2.00 (two new trees for every one removed)”. The overall volume of American hardwoods has more than doubled in the past 50 years. What does all this forest growth mean for the health of the planet? Over the course of a year, 100 trees can remove 53 tons of the greenhouse gas carbon dioxide. Those same trees can also pull 430 pounds of other pollutants out of the air. This is in addition to the increased biodiversity of flora and fauna that comes with expanding, thriving forest habitat. So yes, removing a tree is good for the planet — when that tree is an American hardwood. This precious natural resource adds beauty to the world in finished products and represents the ultimate in sustainability.